In recent years, the choir has undertaken tours to Canberra and Melbourne, and is planning a tour to England in July 2016. In 2011, the choir released a CD of its favourite choral anthems entitled “O for the wings…”, which included the world premiere recording of Grayston Ives’ Evening Service in D. The choir’s next recording project will include anthems and carols for Advent and Christmas. 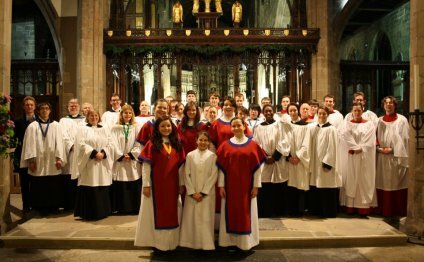 The Cathedral Youth Chorale is the newest member of the choral family at the Cathedral, having been formed in 2014. The Chorale was established to enhance the education of young musicians in the area of vocal production, aural and musicianship abilities and ensemble skills, at the same time providing performance opportunities in one of Australia’s finest cathedrals, and Newcastle’s most prominent landmark. The Youth Chorale is for young people aged between 15 and 18, and sings repertoire from Europe, The United Kingdom, North and South America, Asia and Australia. It draws on modern repertoire and some of the finest music in our tradition. Musicianship and aural awareness are paramount to being a good chorister and musician, and as such will remain a constant and strong focus of the choir. This is a great way to develop abilities that will help students preparing for private instrumental or high school music exams. The St Nicholas Choir is a training choir for children aged 8 and up. The choir sings for the regular “Family” services at the Cathedral and prove a very popular choice for weddings.